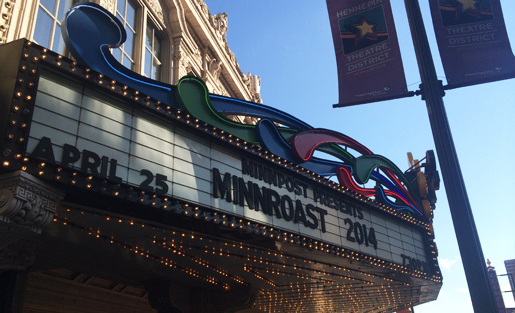 At MinnRoast, politicians and journalists skewer each other to raise money for non-profit news site MinnPost. Photo by Jake Batsell. MINNEAPOLIS — The downtown State Theatre boomed with laughter, applause and satire-drenched showtunes on the last Friday in April during MinnRoast, the annual revue where the state’s politicians and journalists “gently skewer” one another to raise money for the non-profit news site MinnPost. When your biggest fundraiser of the year is a comedic romp, it doesn’t hurt when your junior U.S. senator happens to be a veteran “Saturday Night Live” writer and cast member. Sen. Al Franken’s irreverent monologue got the crowd revved up, and headliner Lizz Winstead — co-creator of “The Daily Show” — kept the laughs rolling with sharply elbowed stand-up bits sprinkled between songs and skits that included a cameo by the University of Minnesota’s marching band and Gov. Mark Dayton vaping away on e-cigarettes. It was a rollicking spectacle, and the crowd of nearly 1,400 went home happy. More importantly for MinnPost, the show raised roughly $160,000, accounting for about 10 percent of the site’s annual revenue. Once costs are settled up in the coming weeks, MinnPost executives expect that the event’s net proceeds will comfortably exceed six figures, generating serious income that can pay for more of MinnPost’s respected public-interest journalism. Joel and Laurie Kramer, the couple who co-founded MinnPost in 2007, said the site’s early backers wanted to establish an annual fundraiser that also was lighthearted, in the same tradition as the Gridiron Dinner in Washington, D.C. But they also saw a market opportunity in embracing the fun factor. Joel Kramer, MinnPost’s CEO and editor and a former publisher of the Star Tribune, noted that the Twin Cities region is saturated with serious events run by civic-minded organizations such as Minnesota Public Radio, the Citizens League and the University of Minnesota’s Humphrey School of Public Affairs. From a strategic standpoint, Kramer said, MinnPost thought a fun-themed event had a better chance to attract sponsors and ticket sales than more straight-laced affairs. For seven years running, MinnRoast has proven that hunch right. For too long, news organizations have resisted the idea that engaging their audience in person can actually be fun. In my forthcoming book, “Engaged Journalism: Connecting With Digitally Empowered News Audiences” (Columbia University Press, January 2015), I argue that the Achilles’ heel of the “civic journalism” movement of the late 20th century was that it deemed engaging its audience to be a solemn “obligation to public life,” as the now-defunct Pew Center For Civic Journalism’s website continues to rationalize. Today’s most successful news events strategies view face-to-face engagement not as an obligation, but as an entrepreneurial opportunity, as I discussed last year in a presentation at the International Symposium on Online Journalism. News events don’t always need to be fun and games. But why not try to deliver a little levity once in awhile when convening your audience in person? GeekWire, the 3-year-old startup that has become Seattle’s digital hub for tech news, has an annual ping-pong tournament bash to celebrate its anniversary. WBEZ, Chicago’s storied public radio station, throws chef battles and drive-in zombie movies. Politico Pro hosts trivia nights in Washington, D.C. The list goes on. MinnRoast has drawn criticism from cranky journalists who fault it for “giving the impression that we’re buddies with the powerful and political types who shouldn’t be calling us to find out when we’re available for golf or beer.” To be fair, news-themed events — both humorous and serious — do entail a certain sense of coziness with sources, at least during the planning and execution of the events themselves. That can lead to an awkward sense of tension, but it’s a reality that modern news organizations need to navigate as they search for viable business models. At MinnRoast, newly elected Minneapolis Mayor Betsy Hodges made comedy out of that tension, reading passages from MinnPost articles that have been critical of her fledgling tenure. “Thanks, Joel,” Hodges sarcastically quipped to Kramer. Yet for all the kid-glove chumminess of MinnRoast, if MinnPost’s watchdog journalism weren’t perceived as credible, neither the event nor the site itself would have lasted for seven years. I asked Joel Kramer why he and Laurie continue to work for free. Jake Batsell (@jbatsell), an assistant professor of journalism at Southern Methodist University, is spending the 2013-14 academic year as a Texas Tribune Fellow based in Austin. This post originally appeared on NewsBiz.